This massive book clocks in at 57 pages, 1 page front cover, 1 page editorial, 1 page SRD, 1 page back cover, leaving us with 53 pages of content, so let’s take a look! So, basically, this is a system that tackles the caster/martial-discrepancy…but this time, in DCC! The basic idea is that combat, in the hands of capable warriors, ought to be lethal. In DCC’s rules, though, much like in most systems that grew out of d20, casters get insta-frys where martial characters have to slowly whittle down the HP. This book then takes a different approach: First of all, the system here is based on so-called Mighty Deeds: Cutting open your foe and tearing the intestines apart, badass-kicking foe into the huge pit while yelling “This is SPARTAAA!” – you get the idea. However, this also means that there’s a risk: On a natural 1 on both attack and deed die, you incur a mighty fumble. On a critical hit and maximum number on the deed die, you score a mighty critical, though! Generally, luck cannot be burned to effect a Mighty Deed and neither can deed rolls be affected by burning luck. However, you may burn luck to add to your attack roll. Of course, the judge has the last word with individual uses of deeds. Got that? All right, so what this pdf thus does is provide a VAST array of tables – each type of attack is associated with a weapon/fighting style and sports 7 effects, from mighty fumble to mighty critical. Beyond that, a description and sample quote makes sure that you know what the maneuver entails. For convenience’s sake, deeds from the core rulebook have been reprinted here – which imho is a great thing. Why? It Prevents annoying book-swapping. The descriptions are inspired and visceral – to give you an excerpt from the 7+ result of Bone Crusher (which needs a two-handed blunt weapon): “Your blow shatters opponent’s sternum splintering ribs and collapsing a lung. Blow causes 1d8 points of additional damage from internal bleeding. Opponent must make a Fort save against warrior’s damage total (include extra 1d8 in total)…” And yes, the effects continue. Let me geek out for a second here – this is visceral, raw and awesome. I LOVE this! Decapitating strikes, defensive fighting – there are so many options herein I’d bloat this review beyond 10 pages, were I to comment on each individual one. Even options like using Stand your Ground as an unmounted warrior versus a mounted foe are covered. “But wait”, I hear you say, “this will be a horrible flipping mess to sue, right?” No. Such books live by their organization – and here, the book excels as well. The appendices contain handy condition modifiers, options for even grittier games, a handy table of mighty deed modifier by opponent HD, a blank mighty deed sheet for your own custom deeds…and a massive index that lists all mighty deeds by weapon, rendering this pdf easy to use. Editing and formatting are very good, though not perfect – I noticed a couple of punctuation glitches, though nothing that impeded my ability to understand the rules as presented herein. Layout adheres to a printer-friendly two-column b/w-standard and the book sports numerous neat original full-color artworks. The pdf comes fully bookmarked, with each deed getting its own bookmark, making use of this book in its electronic version quick and efficient. To me, this pretty much constitutes a friggin’ homerun. I really love DCC’s gritty aesthetics and lethality and this pdf adds spice to this: The vastly expanded deeds render playing any fighting class infinitely more compelling. When first reading these rules, I feared they’d increase lethality too much – and they kind of can…but honestly, neither me, nor my players cared. The payoff of “Did you see what I just did there? ?” versus being off’d (happened once in my playtest) in grisly manner led to an unanimous decision to keep this pdf. What we have here, is perhaps one of THE absolutely required, must-own pdfs you can get for DCC. It vastly enhances the visceral, awesome flair of combat and makes martials feel more versatile and badass. One piece of advice: You may want to get this in print if that’s your preferred medium – this sees a LOT of use in a pretty short time, being pretty much indispensable. A must-have supplement well worth a final verdict of 5 stars + seal of approval – congratulations to author Marzio Muscedere! Oh, one more thing – since I consider this absolutely ESSENTIAL for any DCC-judge, I’ll add my EZG-Essential tag to this…if a couple more books of this caliber hit my HD and you, my readers, want to see it, I will provide a full DCC-Essentials-list! 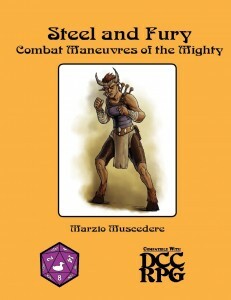 If you’re a DCC-judge or player, you can and should get this awesome tome here on OBS or here on d20pfsrd.com’s shop!